Winter Gardening is mostly a matter of preparation for the coming growing season – or so you may think! However with modern (and ancient) gardening techniques you are in fact able to grow a surprising amount of vegetables throughout the year. A lot of course depends on where you are located. However with the tips and ideas included in this book, you will find ideas not only for general winter gardening preparation but also some great ideas for growing vegetables well into the winter period. A list of 5 main tasks to be done over the winter that will enable you to get the best out of your garden including a list of cool season vegetables that you could consider for your winter gardening efforts. Protecting Winter Vegetables: How to best protect your vegetables from the elements over the cold winter period. Planning Ahead: Winter is the ideal time to get your plans in order before the coming spring growing season arrives. Some great ideas and tips for planning your veggie garden or Raised Bed. Tools & Equipment: How to best preserve your valuable tools over the winter period. A good selection of miscellaneous tasks to be done in and around the garden. Tasty Soup Recipes! 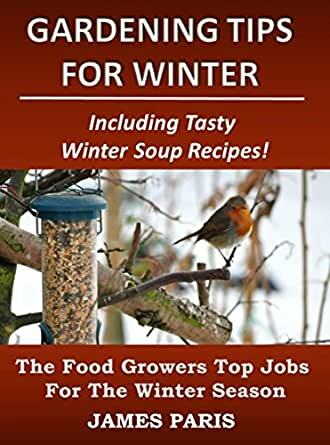 A selection of tasty hot winter soup recipes to warm you up on those cold winter evenings. Courtesy of F A Paris from the Easy & Tasty Soups book. I have a hard time of being prepared for spring planting. This book is what I will use as my "to do" list. It will make it easier to get it done ahead when there are different ways to do it. A great book for the Prepper library.